Journalists and Twitter go together like glitter & Broadway. * When digital pilgrims set sail for the new world-wide-web platform in 2006, reporters were some of the first tweeples on deck. Turns out Twitter is the perfect place for them to be timely, connected, and bylined without an editor looking over their shoulder. I’ve never talked with a reporter who said, “I <3 emails from PR people.” But so many of them love Twitter. And it’s awful nice (and important) to engage with them on a platform they love for a change. The big question is: Uhh…how? Where do I even start? Start here. Right here, right now are 13 Twitter media lists that M+R’s PR people made just for nonprofiteers. Like… Do you work on environmental issues? We’ve got a Twitter List full of the top enviro reporters for you to monitor and engage. What about my international development crew? Yep, we’ve got you covered too. Health, Education, Faith, LGBT, Poverty & Wages, Transportation, Justice & SCOTUS, Reproductive Rights, Guns, Immigration, and Philanthropy? Yes. You get a Twitter List and YOU get a Twitter List and YOU get a Twitter List! I know. I can’t wait to use them either. 1. Ask a question: When you ask people questions, they tend to reply. Reporters are people. Ergo, logic. 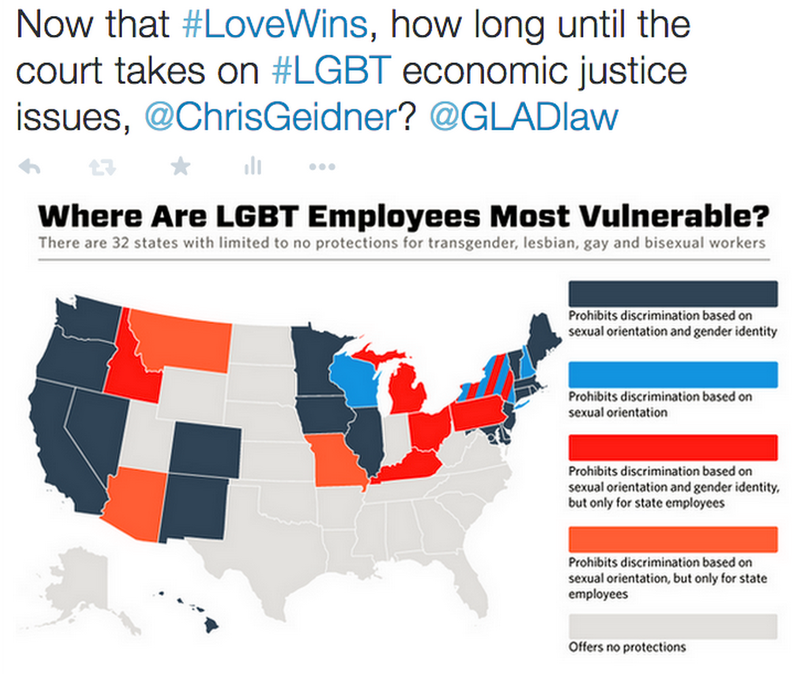 Why tag BuzzFeed’s Chris Geidner? He’s one of the best reporters out there right now focusing on LGBT issues and the law. While the Twittersphere spent most of June #WaitingForLyle, I was looking to Chris’s feed for my SCOTUS news. 2. Mention: Casually drop a reporter’s Twitter handle at the end of your tweet if you’re saying something that’s up their alley. You can get the same effect by tagging up to 10 reporters in TwitPics when you want them to see what you’re saying. Why Tweet NBC News legal analyst Lisa Bloom? She’s an expert on civil right issues and is passionate about equality. And I know that because I keep tabs on her in the Justice Twitter List! 4. Reply: Join a conversation already in progress by replying to a reporter’s tweet with additional info about a topic that she or he started. 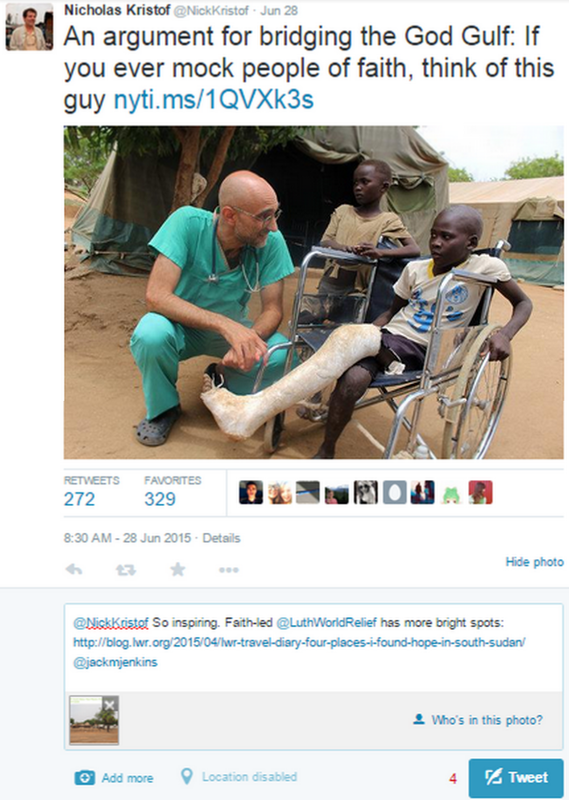 Why reply to @NickKristof’s tweet with another journalist’s article? Do it for the twofer. With one reply, you can offer two journos information that could be a valuable resource to both of them. Why does favoriting NYT op-ed editor Sewell Chan’s tweet about #TheNew10 make sense? Firstly, because he has good taste in American heroes. Secondly, there’s a chance that after connecting for a while, he’ll be more likely to recognize your name in his overstuffed inbox. Little personal engagements like this aren’t going to get your next op-ed in his paper. But they’re nice to do anyway…for the journalist…and honestly for you too. That brings me to my ultimate best practice for engaging reporters on Twitter. 6. When you do it, do it because it feels good, genuine, fun, and a little thrilling to connect with someone who’s passionate about a subject you’re passionate about. If you’re just reaching out for the press hits, then your tweet is no better than the email that a reporter hates. Which Twitter Media List should we make next? Do you see someone we’re missing on the current lists? Tweet us @mrcampaigns with your ideas and we’ll try to make your dreams come true! *Are you digging Taye’s new Hedwig headshots too? That poster deserves a Tony. Great post! Lots of great ideas. Do you find that tagging a reporter when sharing their stories is effective too? Oh yeah totally. Reporters love getting love. how about a Middle East reporters or Israel/Palestine reporters list?